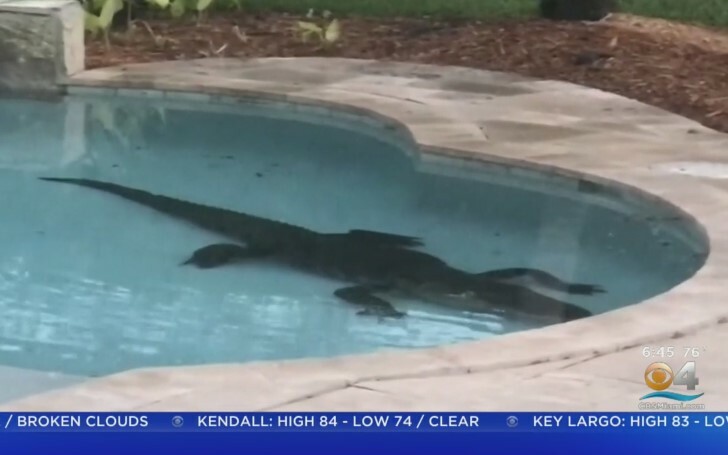 Florida couple left stunned to find 9-Foot alligator in their backyard pool. A Florida couple spotted a gigantic alligator at the bottom of their backyard pool leaving them stunned. Senta Evans was thinking of letting her dogs out Monday morning in Palm Beach Gardens so she went to check on potential hazards, that's when Evans spotted the massive 9-foot gator at the bottom of the pool. Evans' husband, Mike, was shocked by the size of the alligator since he was expecting a small reptile when his wife summoned him to the pool. "The trapper came out here with some gear to get a 6-foot alligator out. He said, 'That thing's 9 feet,' and he went back and got bigger gear. It was kind of nuts." The trapper worked for about 20 minutes to hook the gator and hoist it out of the water while the couple filmed the video. As per the trapper, the gator might have gotten into the yard squeezing under their chain-link fence. He assured the animal would be relocated to a more suitable habitat. Meanwhile, FWC said reptiles are likelier to get out into public in greater numbers since their mating season is commencing.